Red Deer Rebels coach Jesse Wallin would need to think back 16 years to recall the caliber of draft-eligible talent available on defense from the Western Hockey League this season. "The last time we had this many defensemen coming out in the draft was 1996 … my own draft year," Wallin told NHL.com. "But I think this crop is at a much higher caliber than it was in 1996. It's pretty special that we have this many top-end defensemen that are in the league and certainly there will be some fun guys to watch this year." Eight WHL blueliners were chosen in the first three rounds of the 1996 Entry Draft, including six first-round picks. Wallin, a defenseman for Red Deer, was the final choice in the first round, going 26th to the Detroit Red Wings. Ottawa selected defenseman Chris Phillips of the Prince Albert Raiders with the first pick. There could be as many as five defensemen from the league taken in the first round when the 2012 Entry Draft is staged at the Consol Energy Center in Pittsburgh in June. While there's little doubt this year's draft is top-heavy with defensemen, perhaps the better question is which blueliner of the bunch is considered the best. At this early stage, it appears Ryan Murray of the Everett Silvertips and Matt Dumba of Red Deer are the frontrunners. If that's indeed the case, how can the average fan differentiate between the two standouts? "Murray is one of those calm, cool and collected guys … an excellent skater with a lot of poise," NHL Central Scouting's David Gregory told NHL.com. "He really defends well because he's so confident skating backwards and really uses his positioning well. He's the kind of guy you can see making a move or two, taking it up ice and springing someone on a tape-to-tape type of pass -- he'll end up with a ton of assists." However, the Everett Herald is reporting Murray will be sidelined for about five weeks with a sprained ankle he suffered in an 8-2 loss to the Brandon Wheat Kings on Oct. 19. Prior to the injury, he had 3 goals and 6 points in 10 games. "Dumba is more of the run-and-gun … a gunslinger-type of guy," Gregory said. "He has a ton of skills and is a guy who will come at you hard in the corners and plow you down. I don't think he's as solid defensively right now as Ryan, but he's not afraid to throw his weight around and you can't help but notice him on the ice." Here's a look at the top seven players from the WHL, listed alphabetically, who could hear their name called in the opening round of the draft. Last June, a total of 33 players from the league were chosen over seven rounds, including five in the first round. Matt Dumba, D, Red Deer Rebels: It'll be interesting to see what the 5-foot-11, 183-pound right-shooting blueliner can do for an encore after being named the WHL's rookie of the year in 2010-11 when he led the Rebels in rookie scoring with 26 points (15 goals). An explosive skater capable of reaching top speed in a hurry, Dumba also has a knack for making the big, open-ice hit. "Every time he steps on the ice, chances are you're going to notice him doing something, whether it's making a great big hit or big rush up ice," Wallin said. "He's just a different style of player in that regard." 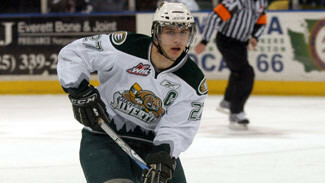 Ryan Murray, D, Everett Silvertips: The second-year captain of the Silvertips has a very good chance of earning a roster spot on the Canadian National Junior Team that will compete at the 2012 World Junior Championship in Edmonton and Calgary in January; he came close to making the team as a 17-year-old last year. In two WHL seasons, Murray has 11 goals and 73 points in 122 games and is the team's all-time leader with a plus-51 rating. He also has 3 goals and 11 points in 16 WHL playoff games. "Why is Ryan Murray our best player?" said Everett coach Mark Ferner. "Because he works at it in everything he does. He's got a pro mentality at 18 years old and you don't see that very often. He's very focused and cares about teammates and cares about wins and losses. So far this season, he's probably averaged between 27 and 30 minutes a night." Derrick Pouliot, D, Portland Winterhawks: The first pick of the 2009 WHL bantam draft, Pouliot led Portland's rookie defensemen in scoring with 30 points, including 25 assists, in 66 games last season. He represented Canada at the 2011 Ivan Hlinka Memorial Tournament and competed for Team West at the 2011 World U-17 Hockey Challenge. At 5-11 and 186 pounds, Pouliot can quarterback a power play and offers a cannon-like shot from the point. "He's a pretty smooth defender who is under the radar," NHL Central Scouting's B.J. MacDonald told NHL.com. "He's very poised under pressure, a smart puck mover and has very good on-ice awareness. He's got deceptive speed and knows when to jump into the play to make an odd-man rush. He's solid and safe in his own zone, but could learn to close a little quicker and with more assertiveness." Griffin Reinhart, D, Edmonton Oil Kings: Reinhart already is earning comparisons to Nashville's Shea Weber for his hulking size (6-3 3/4, 207 pounds) and tremendous mobility in the back end. His father is former NHL defenseman Paul Reinhart, who scored 560 points in 648 games over 11 NHL seasons with the Calgary Flames and Vancouver Canucks. His older brother, Max, a third-round pick (No. 64) of the Calgary Flames in 2010, began his fourth season with the WHL's Kootenay Ice in 2011-12. Griffin Reinhardt no doubt will receive much more ice time in his second full season with the Oil Kings after totaling 6 goals, 25 points, 36 penalty minutes and a plus-7 rating in 46 games as a rookie last season. "He's a big package and knows how to use it," MacDonald said. "He's very strong in the corners and battles in front of his own net. He's solid 1-on-1, can eliminate opposing forwards convincingly and is physically strong in all areas of the ice. "He'll develop into a rock-solid, big presence for an NHL team … he has huge upside." Morgan Rielly, D, Moose Jaw Warriors: Rielly led the Warriors rookie defensemen in scoring last season with 28 points, including 22 assists, in 65 games. Prior to joining Moose Jaw, the 5-11 1/2, 190-pound left-shooting blueliner captained Notre Dame College (Wilcox, Sask.) in 2009-10, leading the league's defensemen in scoring with 55 points (18 goals) en route to the Telus Cup, Canada's national midget hockey championship. "He's one of the few players, and defensemen, that has another gear," MacDonald said. "Morgan's an effortless skater, always thinking offense, and is a very good on-ice thinker … he plans a step ahead and makes those smart outlets and can follow up a play in the blink of an eye. He just needs to pay a little more attention to zone coverage and close quicker in his own zone, but the potential is there." Colton Sissons, RW, Kelowna Rockets: After spending most of last season as a third-line player, look for the 6-1, 189-pound Vancouver native to be counted on more this season. Sissons finished 12th in scoring among first-year WHL players with 41 points (17 goals) in 63 games last season, and his plus-15 rating was the highest on the team. Acquired from Saskatoon during the 2009-10 season, Sissons is considered to be one of the more well-rounded point-producers in the league this season; his two-way game is what will attract many scouts throughout the NHL. "He had a solid rookie year and shows potential; his size is good and he plays his position well," MacDonald said. "We'll watch to see how his confidence levels are and how much improvement he makes during the year. I suspect he'll be much improved in the second half of the season." Chandler Stephenson, C, Regina Pats: The fifth pick of the 2009 WHL bantam draft, the 5-10 1/2, 192-pound forward had 7 goals and 20 points in 60 games for the Pats as a rookie last season. Credited for his speed and deceptive shot, the Saskatoon native will take on a larger role in his second WHL season. "He's a strong kid, a very good skater and puck handler," Pats coach Pat Conacher told NHL.com. "I think he's had the good fortune of playing with two very good wingers, too. He's a centerman, so he has to be better in all three zones. I think, right now, among his peers, he's about equal. But now's the time he's got to start pulling away from his peers and really start rising above that group." Stephenson, who has played primarily on the second line alongside Lane Scheidl and Jack Rodewald, led Team West in scoring at the World U-17 Hockey Challenge with 4 goals and 6 points in five games. Stephenson sees plenty of minutes at even strength and on the second power-play unit. "He's a very deceptive skater with good skill and hockey sense," said Central Scouting's Peter Sullivan. "He's not a crasher, but finishes his checks in all areas of the ice. You can tell he thinks the game, while most players just react and get caught doing something wrong."